The most southern of the United States of America, forming a peninsula washed on the east by the Atlantic Ocean and on the west by the Gulf of Mexico. Little is known of the early history of the Jews in Florida. In 1825 a plan was projected in London for the purpose of sending a number of Jews to Florida as colonists, but it proved abortive. However, that Jews settled in the state somewhat later is known, for two of them took part in the Civil war: Gus Cohen enlisted in the Milton Artillery, and M. Daniel was a member of Company A, 1st Regiment Florida Infantry; the latter was captured. Daniel died at Elmira, N. Y., and was buried in Woodlawn Cemetery in that city. 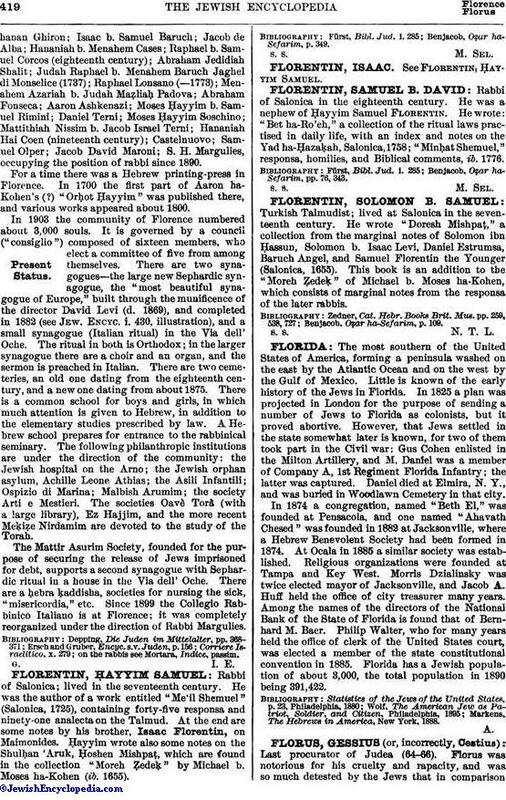 In 1874 a congregation, named "Beth El," was founded at Pensacola, and one named "Ahavath Chesed" was founded in 1882 at Jacksonville, where a Hebrew Benevolent Society had been formed in 1874. At Ocala in 1885 a similar society was established. Religious organizations were founded at Tampa and Key West. Morris Dzialinsky was twice elected mayor of Jacksonville, and Jacob A. Huff held the office of city treasurer many years. Among the names of the directors of the National Bank of the State of Florida is found that of Bernhard M. Baer. Philip Walter, who for many years held the office of clerk of the United States court, was elected a member of the state constitutional convention in 1885. Florida has a Jewish population of about 3,000, the total population in 1890 being 391, 422. Markens, The Hebrews in America, New York, 1888.